This entry was posted on January 1, 2019 at 12:36 AM and is filed under the ugly. You can follow any responses to this entry through the RSS 2.0 feed. You can leave a response, or trackback from your own site. RIP!! Sad it happened away from India too. RIP! Remembering some of his scenes. When Amitabh Bachchan was basking in the glare of stardom in the 70s and 80s, it was the lines that he mouthed that could hit you right in the feels! Most of these magical strands of words that powered blockbusters – the dialogue that gave the stars a hoist, were written by Kader Khan. His use of colloquial language teeming with whimsy, drollery and dark truths made him the most coveted dialogue writer. The veteran Bollywood actor-writer Kader Khan had worked with many leading actors like Rajesh Khanna, Amitabh Bachchan and Govinda and directors like Manmohan Desai and David Dhawan in his long career. Apart from writing Muqaddar ka Sikander, Kader Khan’s one of his early cameo got instant recognition for his clear dialogue delivery and got more acting offers! I really wasn’t aware at how many megafilms Kader Khan was involved in as screenwriter. Most of what I seen him in is the Govinda combo. Jay: Kader Khan is credited to bring the bombayya style dialogues and very casual talk in movies in 70’s and earlier generation was true ‘dialogue’ dialogue writers. Sample this from the below interesting article. By the early 1970s, Hindi cinema had acquired a taste for high-flying Urdu which had almost become pantomime. In an interview, Kader Khan mentioned that he found this style of writing artificial. “I hate this language. These writers, they write all proverbs and muhaavras and similes. I want my colloquial language,” he said. Sample these lines spoken by Bachchan’s delightful Anthony in Amar Akbar Anthony: “Aisa to aadmi life mein do heech time bhaagta hai… Olympic ka race ho ya phir police ka case ho. Tum kaay ko bhaagta hai men?” The addition of Bambaiya slang and the East Indian twang of ‘men’ at the end made Anthony Gonsalves the icon of a million hearts. An important part of my growing up years. A true artist! His Dulhe Raja with Govinda is one of my greatest guilty pleasures. Kadar Khan was also known for his improvisation in humour. A tremendous actor. Could do any kind of role. Had a big hand in those Bachan hits. Those David Dhawan/Govinda films would not be the same without him. The old Bollywood is dead. Dialogues, word play, and laughs. Things have changed now, irrevocably. RIP. Always a big fan of him esp the 80s dialogues. Somewhat inspired me on a personal level with MKS dialogues a link of which has been posted up on this thread. Happy New year livewire…welcome back! Thanks Jay. Wishing you the same. Just posted something for all here on the New year thread. Most 80s kids though will remember him as a supporting, character actor, usually the bad guy in films produced by southern studios. The actor Jeetendra introduced Kader Khan to the south. Initially wary of the literal translations of dialogues in remakes, he was eventually persuaded, with guarantees of no interference, to write the dialogues for “Meri Awaaz Suno” in 1981 followed by “Himmatwala” and many more remakes of Telugu and Tamil films like “Justice Chowdhary”, “Mawali” and “Maqsad”. In almost all these films, Kader Khan also played a villain with Shakti Kapoor as his partner in crime. The double shifts between Bombay and Madras, between acting and writing, took its toll, the language was getting more tawdry, suffused with double entendres. Govinda took over from Jeetendra as the lead in these films but Kader Khan stayed. As the storylines got thinner, the Kader Khan-Shakti Kapoor combo skewed slapstick and then absurd. But the front-benchers couldn’t get enough of it. The 90s saw a change of guard at the movies with the young Khans firmly in charge and Kader Khan’s parts became fewer and far between. He would be occasionally seen on TV remembering the old days and sometimes outing bitter outbursts against old colleagues including Amitabh Bachchan whom he blamed for transforming into a man Kader Khan didn’t recognise. 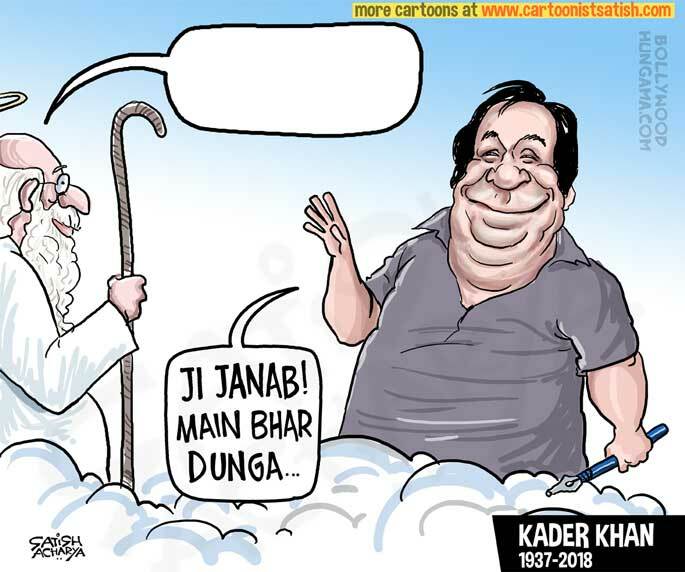 That Kader Khan did most of his work in the time of the “one-man industry” and still managed to shine puts him in the rare league of character actors who left an imprint on Bollywood. That he was among a rarer breed of writer-actors seems to have been lost in the tributes. Khan would write out the scenes and act them out for Desai, who liked Khan’s narration style so much that he would record the conversation on tape. Khan’s ability to breathe life into his lines proved helpful to Amitabh Bachchan, who said in a 2015 interview that he was initially flummoxed by a 16-page soliloquy that Khan wrote for his character in Prakash Mehra’s Muqaddar Ka Sikandar. Only after Khan recorded his narration of all 16 pages on tape was Bachchan, in tears by then, convinced. Few years when they made a joke of Kader Khan I was so pissed and posted some comments here. First they nominated him for Padma Shri in 2015 and during final days before they dropped him from final ceremony citing he’s not worthy for even Padma Shri. He was so pissed and so were Bollywood movie lovers. PadmaShri is the govt recognition for ‘Contribution to Movies and Arts’. It’s the same award which Saif Ali Khan got decade back. It would have been fine if they never nominated and then ignored him as they have been doing for years but then rejecting the nomination is more insult than quiet ignoring. Either ways.. people tend to overlook that such writers have actually helped the Bollywood more than just 1 small actor who received one. "Waqt se pehle aur naseeb ke baad koi cheez agar tere paas dene ko ho, to mujhe de dena." RIP!! An irreparable loss to Hindi film industry!! Highly underrated for his screen & dialogue writing work; played gamut of characters from villain to comedian to layman so effectively. Jeetendra & Govinda owe part of their successful career to him as he was omnipresent in their huge and popular hits. As long as he was alive, the film industry didn’t give him his due nor did the government, but his demise has ‘woken them up’, how ironical yet true!! While Khan is known to be a great actor, very few know that he is the name behind the raise of names like Amitabh Bachchan and Govinda. Kader Khan, 81, submitted to his prolonged illness today, while he was being treated for the same in Toronto, Canada. To be completely honest, these two now legends would’ve probably been incomplete had it not been for Kader Khan’s writing skills. As a memory to the actor, here are some of the dialogues which he penned, that became a superhit for the superstars of today. Kader Khan proved his talent to none other than Manmohan Desai, who gave him one chance to prove himself in his 1974 release movie ‘Roti’. This dialogue, paired with Rajesh Khanna’s acting, earned the film a lot of praises and then begun the rise of Kader Khan the screenwriter. The next thing that you know, Kader Khan wrote dialogues for the already superstar AmitabhBachchan, through Manmohan Desai films and later, just with Big B. Fun Fact: The two became great friends but their friendship soured and Kader Khan moved on to building a newer bond with David Dhawan and Govinda. He gave Akshay Kumar (who plays Khiladi) from ‘Main Khiladi Tu Anari’ this dialogue: “Hume sirf ek take milta hai, sirf ek take… aur agar uss ek take mein humse koi galati ho jati hai … toh maut ke samne zindagi ghutne take deti hai”. The film also starred Saif Ali Khan, who would soon become a part of the ‘Race’. Kader Khan had also written this dialogue for Aamir Khan in Sarfarosh: “Dawa bhi kaam na aaye, koi dua na lage … mere khuda kisiko pyar ki hawa na lage” and we are totally mind-blown already! As an actor who lasted all the way until the mid-2000s, he was no slouch. But the sheer number of acting credits he amassed in one forgettable film after another made you feel that he was just switching sets. The year, 1977. The speaker of that iconic dialogue, Anthony Gonsalves. The film, Amar Akbar Anthony. The director, the king of masala, Manmohan Desai. And the dialogue writer, the one and only Kader Khan. Those lines, and practically every other classic cluster from this bachpan-mein-bichade-bhai blockbuster, made us laugh louder than we had in a long time. We held our bellies. We guffawed. And we returned, just to hear those lines again. And again. By then, Amitabh Bachchan had cemented his reputation as the hero who could fight off 20 people in a godown, wiping blood off his chin, glowering that famous glower. He had also done a bunch of brooding, intense parts in melodramas. The only film before Amar Akbar Anthony in which Bachchan’s funny bone was visible was in Hrishikesh Mukherjee’s Chupke Chupke. What Amar Akbar Anthony did was to give him the chance to cross over to the comic side, and own it. With it, he became the ‘complete star’ and went on to demolish every other pretender to the Number One slot. It could well be that Bachchan got so big because he was at the intersection of a certain time and place in Hindi cinema, but there’s no doubt that a lot of it had to do with the genius of Kader Khan. Khan died in Toronto, Canada on Monday after a prolonged illness. He was 81. Only those who have experienced and loved the masala cinema of 70s and 80s Bollywood will understand the real significance of that moniker ‘dialogue writer’. Khan was the man who made those movies what they were. He spanned 40 years plus in Hindi cinema, coming up with the best lines for Rajesh Khanna, Bachchan and Govinda, and helped create some of their most memorable characters. Perhaps why he did not get even a Padmashree. Maybe he did not have political connections. Maybe his forays into the acting world where he was associated with Shakti Kapoor and David Dhawan films as a sidekick. His double meaning dialogues are a great putoff and he was somehow associated with mild vulgarity and cheap jokes. Masala films are always looked down as B Grade entertainers and his association with them for a long time. He did not look intellectual enough like a Javed Akhthar . It is another thing that less talented and worst personalities in real life got many awards. As far as I know he was not associated with any scandals or bad behaviour. He craved for awards that conferred dignity, he craved for lasting friendships but he did not get any of them. An honest biopic on him? From Kabul to Canada. What a journey! We all know our beginning. But clueless about what awaits us. The sadness of a death makes us once again aware of what awaits everyone of us and the journey we have to take willingly or unwillingly until we get a call. The days are short and the nights are long. That was a fact. His so called comedy roles overshadowed his great writing skills. I was not aware of all his writing for films until recently. I just knew him as some side actor who was always seen with Shakti Kapoor in David Dhawan films. You can’t call that ‘fact’. You are not a journalist. You or someone not being aware doesn’t make it fact. If it is someone’s profession, they need to know realities and can’t write articles based on their limited knowledge. Generally ‘actor’ will overshadow the ‘writer’ easily if one is doing both for usual reasons. Even if you were given to write that article, I’m researched well and wrote a proper tribute instead of writing down basic article from your memory. I’m (sure you’ll)* research well..
Well, that is a fact for me and for some others. Perceptions. For me, it was Kader khan, the actor who was a visible reality. Now I know about him, my perception changed. There are two facts for me. Once before knowing something more about him and the other after knowing about him. Even his complaints against Bachchan. We know about them from his side. But what was the other side? What made Bachchan to distance himself from him? ?Why others like Govinda did not care? For Kader Khan, his complaint is genuine and a fact. But was it really so? We make conclusions from what we were exposed to. That is a fact for us until we come across more details. For some Gandhiji is a Mahatma. For some he is not. There are a number of conclusions about persons which are facts for different people with different perceptions. The perceptions form with what they are exposed to. Will they change their opinions after getting full information? Some may and some may not. I feel Gandhiji was a saintly person even after hearing some negative things about him. My truth remains the same even after getting full information. In that sense, I still feel Kader Khan influenced me more as an actor for good or for bad. I am talking for myself and for some who feel the same about him. After Salim and Javed broke up, Kader Khan pretty much wrote all the dialogs for Amitabh Bachchan, the theater-thumping chawanni-phenking lines that firmly established the angry young man in the Indian psyche. Amar Akbar Anthony. Muqaddar ka Sikander. Naseeb. Suhaag. Do Aur Do Paanch. Lawaaris. Coolie. Satte Pe Satta. And did I forget anything? Yes. Agneepath. long sentences of adjectives one after another, short crisp take-downs, intelligent wordplay, and these dialogs when delivered by a generation of actors who knew how to deliver, the Bachchans and the Govindas and the Mithuns, created the experience of what single-screen cinema was, audience participation through whistles and the ceaseless clatter of coins, and clinging to this, a cottage industry of dialogue cassettes and mohalla duplicate shows. One of his villain acts and he was awesome in Angaar! RIP Sir, may God give you Junnatul Firdosh and give peace to your family. It’s never easy losing a loved ones. Safaraz Khan mocks Govinda and lauds Amitabh! However, Sarfaraz also said that among his colleagues, Kader Khan remembered Amitabh Bachchan fondly in his final days. “There are so many people in the film industry whom my father was close to. But the one person that my father loved the most was Bachchan saab (Amitabh Bachchan). I’d ask my father whom he missed the most from the film industry and the answer promptly would be Bachchan saab. And I know the love was mutual. I want him to know that my father spoke about him till the end,” Sarfaraz told IANS. People tend to overlook the fact that Actor and writer combination is very difficult especially and it is not like any other combination of Actor/producer or producer/director or actor/director. Especially if the actor is so busy himself while doling out his shooting schedules in ‘hours’ and not even shifts and then writing anything in that time frame. An actor writing once in a while is different than full time actor writing all the time. It is extremely difficult job as one needs the time for the writer to come out. Its like Wicket Keeper (like Dhoni) is the difficult position to captain your side as WK will always be on his toes and not much time to think about strategies unlike a regular fielder. Kader Khan’s 1st movie break! Here’s the thing, though. Kader Khan did not just create the 1980s cinema. He created the 1980s. He almost decided on the narrative for the decade. He established the world as he saw it. And the world became him. Where the hero could dance around matkas wearing atrocious wigs, sweaters and suits, taming the womenfolk who alternated between playing Thunder Thighs and Pyaar Ki Devi. Where Advocate Shobha and Meva Ram could co-exist with Naglingam Reddy, Desh Bahadur Gupta, Abdul Karim Kaliya and Pinto The Great Smuggler. It was a realm where he stuffed everything he could, and made it large. Where do you get folks having such deep thoughts? Look at what he said in the interview. He is interested in making folks read the holy book and ASK the Maulvis to point that out in the book!! Stunning! What a noble — which he’s not getting paid for anyway — endeavor! I guess these things have to be intrinsic. You learn from life; you get beaten in life — AND then you write. Kader Saab: RIP — Salute.. However, Bollywood biggies didn’t care to call him once during his ill-health. Son Sarfaraz Khan is upset with the way Hindi film industry has responded to the news of Kader Khan’s demise. “There are so many people in the film industry whom my father was close to. But the one person that my father loved the most was Bachchan saab (Amitabh Bachchan). I’d ask my father whom he missed the most from the film industry and the answer promptly would be Bachchan Saab. And I know the love was mutual. I want Bachchan saab to know that my father spoke about him till the end,” said the doting son emotionally. Mr Khan distracted himself with books. He pored over textbooks of mathematics, physics, applied mechanics and hydraulics, but was passionate about literature, too. He studied the works of Saadat Hassan Manto and Ghalib, acclaimed Urdu writers, and Russian authors such as Maxim Gorky and Anton Chekhov. He contemplated the stagecraft of Konstantin Stanislavsky, and gobbled up texts by Sidney Sheldon and Jeffrey Archer. As an adult he combined these interests, working as an actor and writer during the day and rushing on his clunky Lambretta scooter to teach engineering students at night.